Monitor and control any computer remotely with Sentry Remote. Sentry Remote displays the screen, monitors and logs your child's chat and Internet habits, automatically alerting you when inappropriate words, phrases, or slang is used via email; or your cell phone in real time! Lock down your child's computer remotely, even from your cell phone! Sentry Remote is available as a full featured trial for 30 days. Parents are required to monitor their children's activities on the Web. This is the essence of a parental control service, to which Qustodio is making a change by offering an application that can be consulted and configured remotely. K9 Web Protection is a free parental control that helps you monitor your children on the Internet. The latter provides you with tools to plan connection times, and lists of website themes to prohibit or allow children. KIDOZ is a software specifically designed for children. Completely free, it transforms your computer into a space dedicated to your toddlers. The latter is composed of Youtube videos and video games adapted to their age. Safety for parents and entertainment for children. LUPC allows you to monitor and limit the time spent using the computer or the Internet or applications, programs, games (Example: Counter Strike, Seafight, Merlin...) and to view computer usage. 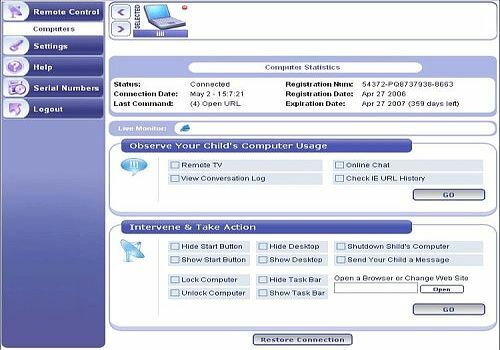 Find an effective and easy-to-use parental control solution. Set up sessions for each of your children to customize their protection. Spy is a software that will allow you to check the uses of your computer in your absence and also serves as a parental control.